This week I decided to participate in the H2H sketch challenge. This card uses one of my favorite new papers from the Florentine paper pack and one of my favorite new stamp sets Enjoy. The border in the middle of the card was created with the zip strip from this sheet of paper with a piece of narrow cocoa satin ribbon added on top. 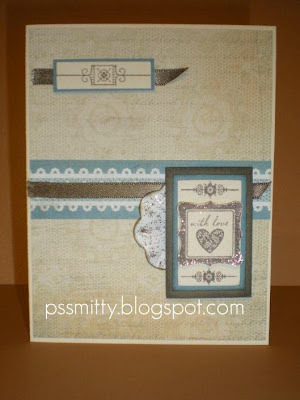 The paper flower and the with love image are "painted" with a tiny bit of Glitz Bronz glitter glue. This adds just the right sparkle! This is the sketch provided, now it's your turn! Very handsome card! Thanks for taking the H2H sketch challenge! Beautiful job on this sketch Patty!! I really love these papers and stamp set too :) THANKS for inspiring us with your creativity!! Love the touch of sparkle on your card! Thanks for playing along at H2H! Very pretty... vintage feeling... reminds me of simple pleasures.